The Hermitage is an old British building, situated in serene and sunny hillock of North of Nainital beneath the mighty Naina peak, 2611 mt. high. Reminiscent of the British Era, The Hermitage is a beautiful Landmark building in Nainital; Uttarakhand built in the year 1880. 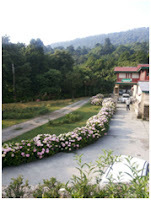 It is one of the rare residential building representatives of the British in habitation in the town of Nainital. 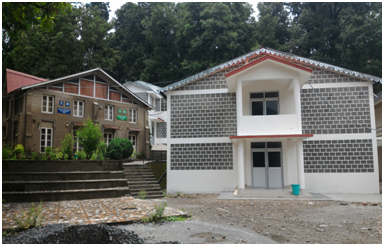 Hermitage is now property of the Kumaun University. The Hermitage was constructed by the British Army officer Colonel W. Barron in the second last decade of 19th Century. This beautiful building is erected under Indo-British architectural style and over decent area of 2248 sq. mt of land in this small town. This building is known for traditional wisdom for its site selection, beautiful wall papers, gradient of stairs, rain water harvesting system, tranquil and pleasant location. 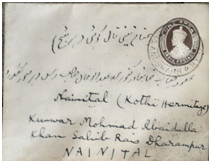 Afterward it was purchased by Nawab Sadabad Kunwar Mohd. Asraf Ali Khan. 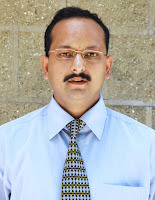 Sadabad is small town in Hathras district of Uttar Pradesh, as part of BRIJ Kshetra. Before independence it was under possession of Kunwar Mohd. Ubaidulla Khan Sahib Rais Dharampur. Later owners did not change the name of this beautiful building, but he made some minor changes in the design and constructed and fabricated a hall known as Rang Mahal (presently known as S. Hall). Later he donated The Hermitage to Kumaun University. 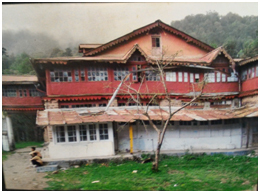 Hereinafter it was gone into litigation by his descendents but finally Kumaun University got its possession.During the time The Hermitage was victimized of weathering and due to lack of care it was turn into dilapidated condition. After creation of Uttarakhand this artistic building was taken care, by the joint efforts of Government of Uttarakhand, specially the then Chief Minister Sri Narayan Datt Tiwari and the University. 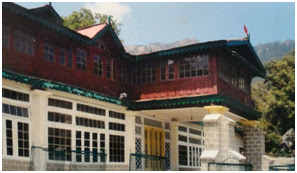 The Hermitage was restored by Indian National Trust for Art and Cultural Heritage (INTACH) with Rs. 2 Crores in 2004. INTACH carried out a preliminary survey of the Hermitage site to generate a proposal for conservation and restoration of this British building of this cultural element. INTACH carried out the conservation and restoration of the cultural elements vis-a-vis the wall papers and the titles. The conservation work was undertaken by the art and conservation centre New Delhi a unit of the Indian Council for conservation institutes. The Hermitage was developed as Centre of IT and companies such Microsoft, Oracle, HP, etc. were invited. Only Microsoft was turned up and started certificate course but later on course was wind up despite full support of the University. Again this campus was disengaged and in the year 2008 UGC-Academic Staff College now renamed as UGC-Human Resource Development Centre of Kumaun University manned The Hermitage again. Now this building and adjoin area is known as Centre of Academics and being shared by the prestigious UGC-Human Resource Development Centre, Department of E-Commerce, Department of Tourism and M.Sc. IT of Kumaun University. S. Radhakrishnan Hall is now utilizing for several academic activities.